On July 1, 2002, I became the director of the Rhode Island SPCA, the third oldest humane society in the United States, after a 34-year career as an equine veterinarian. My whole life I’d been involved with horses in some way; I had a dog or two as a child, but always favored horses from an early age. This was a new career for me without any more nighttime emergencies or weekends spent roaming the countryside, caring for horses. My son Tim had graduated from college and secured a good job, and my wife Marie and I were finally free. This all changed in a matter of months because of a three-year-old black Labrador Retriever given up by his owners who no longer had time for him in their lives. His name was Marvin. Marvin seemed to be a nice dog but had a disability. His right hind leg had been injured when he was a young pup, and he could hardly bear any weight on it. After a few weeks in the shelter a young man came in looking for a family dog. Marvin fit the bill despite his leg problem. I saw Marvin leave the shelter that late summer day wagging his tail, thankful for a second chance. As the leaves began to turn colors that fall, Marvin was brought back to the shelter, unwanted for no good reason for the second time in his life. He’d done nothing wrong, but he accepted his return to the kennel. I really don’t have an explanation as to why our eyes kept meeting on my morning visits to the kennels, handing out snacks to the dogs that were with us. Marvin was always there at the front of the cage, staring at me while he gently took a treat from my hand. I’d learned it’s a bad sign if a dog stares at you, but I saw Marvin’s gaze as a sign of friendship. I told my son about this wonderful dog and he said, “Dad, you should adopt him.” The thought of bringing home a 90 pound dog that shed didn’t go over too well with my wife. My son persisted. I convinced my wife to visit Marvin at the shelter and it went so-so. She’d been attacked by a large dog as a young girl and that fear never seems to wane. But as the weeks passed, no one seemed interested in the black Lab who’d been given up twice and had a disability. Marvin had now spent well over a month in the shelter. After a few more conversations with my son and wife, we decided as a family to give Marvin a third chance rather than no chance at all. On November 1, 2002, I officially adopted Marvin with a caveat: he would be my dog and live at the shelter. Thanksgiving was just around the corner and my son told me to bring Marvin home for Thanksgiving. One major problem: we were having 16 people over for dinner. To make a long story short, Marvin came home for Thanksgiving dinner, met many family members, and has never spent another night at the shelter. Five years have passed since Marvin became my (and my wife’s) best non-human friend, and I don’t regret one day of them. Keeping up with him is no easy task. He has written a children’s book titled Marvelous Marvin and visited over 94 different nursing homes, hospitals, day care centers, schools, libraries, and summer camp programs in three different states. He’s involved in the RISPCA statewide education program and has become a watercolor artist. He has received numerous awards for his community service and is possibly the only dog in Rhode Island history to have met with two sitting mayors and a governor. Marvin has raised over $88,000 from the proceeds of his book and paintings, becoming the largest contributor to the RISPCA. All money raised by Marvin goes into the Marvin Fund, a charity he founded to help creatures great and small in need of food and shelter. The fund also assists the elderly, disabled, and less fortunate pay for medical care for their pets when no one else will. 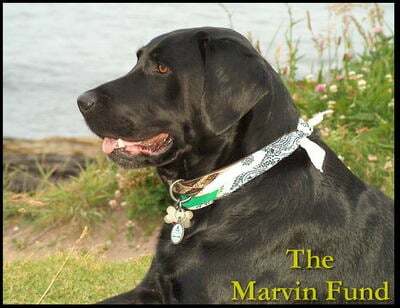 Through the Marvin Fund over 750 pets have been helped. It’s truly amazing to see how much the elderly people in nursing homes enjoy Marvin’s company. Seeing the smiles on their faces is something I will never forget. When he visits underprivileged children in the inner city, we leave optimistic that his message of hope may change the life of just one child. His visits to sick children allows them to forget their illnesses for a brief time and when they hear his story, they know there’s always hope. Marvin has brought me to places I’d heard of but never experienced. Because of him I now look at life much differently than I once did. He’s taught me to be grateful for everything I have in life and not to complain about the little inconveniences. He taught me that regardless of how dark it may get in someone’s life, it doesn’t take much to show them a few rays of light. Imagine learning this from a dog! My life and that of my entire family has been enhanced by a dog who was rejected twice in his life. Although Marvin won’t be with me for many more years to come, I’ll forever remember the wonderful years we spend together making life a little bit better for others less fortunate.